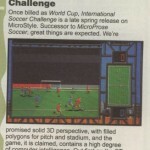 Due to come out on the C64 in 1989, International Soccer Challenge was one of several games due for release by Microstyle in the 1989/90. ISC was also released on the Amiga, Atari ST and PC platforms, but the C64 version never came out – why? The game itself seems rather odd in presentation; the viewing screen of the game is a giant stadium screen, with information dotted around it on smaller screens. While an innovative attempt to stand out from the rest of the genre, it does seem to unnecessarily limit the screen space dedicated to actual game play. Microstyle, the company publishing the game, were the UK home of software giant Microprose, who also had an American equivalent of Microstyle, called Microplay, though I cannot find out if this label actually released anything. 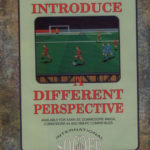 I have to admit to finding this a bit confusing simply because the title of the game, with the word ‘soccer’ instead of the UK and European term, ‘football’, would suggest an American company – perhaps Microprose chose the title or the name was designed to appeal more to an American market, which is where the largest market for the C64 was, after all. Alternatively it may be simply that the game didn’t receive particularly great reviews on the other systems, and with the market leaving the 8-bit scene behind they decided to pull the plug on the C64 version. Although we have an advert with reference to a C64 version, others have no mention of the Commodore 64 so it seems the game was possibly pulled even before the release of the 16-bit versions. This could suggest they ran into difficulties with a C64 port, and decided to scrap it altogether. 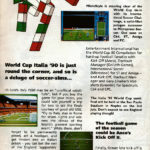 Of course, all this is conjecture, there’s no real way of knowing what happened to the C64 version of International Soccer Challenge, or how fully the game was developed, unless we track down and speak to someone who worked on the game itself or with Microstyle at the time. Of the four games Microstyle did release on the C64, it seems the team working on each game was completely different, so it seems unlikely that someone who worked on one of the games, such as Rick Dangerous 2, necessarily worked on ISC. For now it’s a dead end, but we can remain hopeful that something of the game exists, it has been spotted on a list of cart games in Commodore Format again suggesting they were confident it could be made and released, its just up to us to find it – now that’s a challenge!